Flowers are one of God’s greatest gifts. They bring beauty to our world and joy to our lives. Most people love getting and giving flowers. Unfortunately, real flowers last only a short time, then wither and die. Almost every crafty person loves receiving flowers, growing them in their gardens and also making paper versions to decorate their homes. Paper flowers can also be used as party decor and as gifts. They are very easy to craft, and it is surprising how upscale and refined the finished product can be. Paper flowers have become quite trendy during the last few years. It is incredible how realistic some paper flowers are, and how beautiful fantasy flowers can be. It is all up to the paper crafter. You can go as big or as little as you like. You can make them sparkle and shine or keep them as close to nature as you wish. This particular flower craft is on the fantasy flower side. Make it from brown kraft paper with a curled paper twist. We have to admit that these paper flowers do take a lot of time to make, but you will be very pleased with the end results. The flowers are beautiful enough to display in your home and look marvelous when arranged in brown paper flower bouquet with other organic elements. Just follow the step by step guide, and you will have lovely paper flowers in no time. 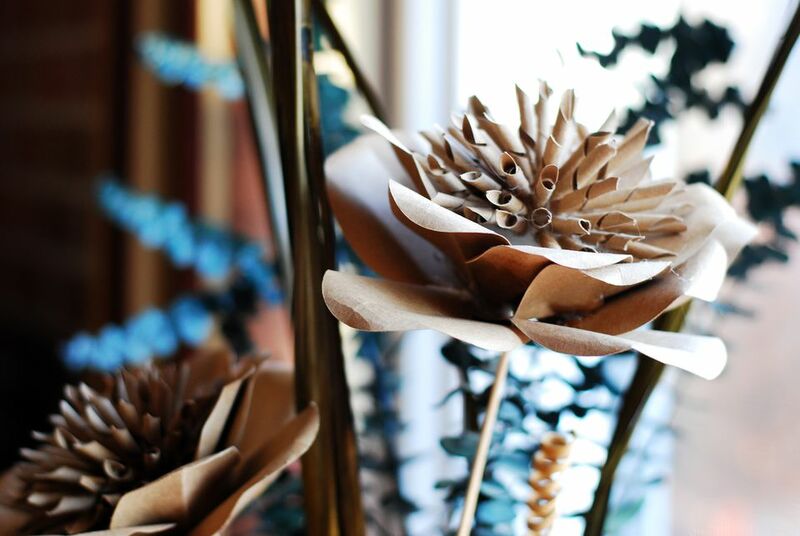 You will need to gather approximately four sheets of brown Kraft paper cardstock to make a flower. Lay the paper out in landscape format onto the paper cutter. Cut the cardstock into 3/8” paper strips with the paper trimmer. Wrap each paper strip around a 3/16 inch wooden dowel, as in the photograph above. Secure each end of the rolled paper strip with a wooden clothespin. Spray the paper covered dowels liberally with water and place on metal baking sheet. Bake the paper wrapped wooden dowels in a preheated 225-degree oven for 10 minutes. Take the tray out of the oven and allow the wooden dowels to cool. Remove the clothespins and slide the paper curl carefully from the wooden dowel. Allow the paper curls to cool. Cut 1.5-inch curly spikes from the paper curl. Cut one end of the paper spike on a diagonal line and the other end on a horizontal line. You will need approximately 60 spikes per flower. Insert the top of a two-foot section of the 1/8 inch round dowel into a Styrofoam ball and secure with hot glue. Start at the top of the ball and glue a paper spike onto the Styrofoam ball as in the picture above. You will have to hold the spike for a little while until the glue sets. Continue gluing spikes covering the upper half of the styrofoam ball. Download the leaf template and die cut files. The file will contain two templates, one large petal, and one small petal. Cut nine of the small petals from the brown Kraft paper cardstock. Cut five of the larger petals from the brown Kraft paper cardstock. Fold each petal in half lengthwise and then unfold. Curl the sides and top downward to give the petal some dimension. It helps to roll the petal around the larger wooden dowel to bend it and give it form. Start gluing the smaller petals around the upper portion of the Styrofoam ball in a circle under the paper spikes. Next, glue the larger petals around the Styrofoam ball. You may have to push and prod the leaves, using the hot glue to secure the petals to the ball in places where the white parts of the ball show through. Now that you have finished your Kraft paper flowers take the next step and make a floral arrangement. These flowers look gorgeous when arranged in a vase in groups of two or three, and have natural elements such as eucalyptus, etc. as fillers.